Are you a graduating Fulton Schools student? Participate in this year’s Engineering Induction Ceremony! 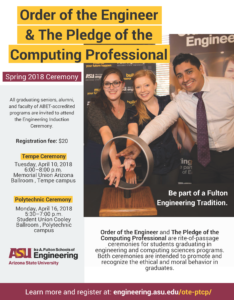 Order of the Engineer and Pledge of the Computing Professional are rite-of-passage ceremonies for students graduating in engineering and computing sciences programs. Both ceremonies are intended to promote and recognize the ethical and moral behavior of graduates. A one-time initiation fee for the ceremony is $20. Order of the Engineer is a commitment to uphold the Oath in engineering practice. The Order consists of individuals seeking to uphold the integrity, honesty and values all engineers should possess to better society. It is a lifelong commitment that begins with this Ring Ceremony. The ring is a symbol of the commitment to the Oath and is worn on the small finger of the working hand. ASU undergraduate students that will be graduating this Spring are invited to attend, along with faculty and alumni. The Pledge of the Computing Professionals is an organization to promote the notion of computing as a recognized profession at the time of graduation for students in Computing Science and related programs. The Pledge is modeled after the Order of the Engineer – a long-standing rite-of-passage for graduates from engineering programs. The Pledge of the Computing Professional is solely intended to promote and recognize the ethical and moral behavior of graduates of computing-related degree programs as they transition to careers of service to society. At this time there is not an option to take the Order of the Engineer or The Pledge of the Computing Professional oaths online. You may take the Oath by finding the nearest link or node to your location and registering for their ceremonies by using the following links. Remember, once graduated you may take the oath at any time during your professional career. If you have any problems locating your nearest link or node please contact Chase Norris at chase.norris@asu.edu who will help you connect. 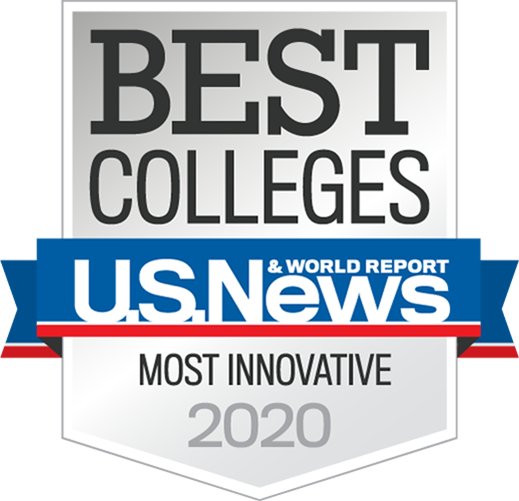 If you have any questions, please email Chase Norris at chase.norris@asu.edu.